Throughout this month-long backpacking trip I have been so fascinated to feel and taste Christmas spirit in a number of European cities. The festive atmosphere started rather early in Aix-en-Provence when the local artisans and traders began decorating their little chalets along the Cours Mirabeau in the second week of November. Dozens of cozy wooden cabins were lined up on both sides of the wide boulevard, selling unique handmade souvenirs of numerous kinds from traditional lavender soaps, essential oils, scented candles to jewelry, tasty sweet treats and oh-so adorable festive paper crafts. Things got more serious when I came to Brussels. A 20-meter-tall Christmas tree was erected outside the Grand Palace and there was a month-long light show every evening from 25 Nov, drawing massive crowds from all walks of life to the city’s central square. The Christmas markets weren’t fully set up at the time but I could feel the joyful festivity in the air. The illuminated palace. The sweet smell of waffles and chocolate. People rushing around to buy the perfect Christmas presents. And the wagon and sleigh rides. The authority also announced to dress up their iconic Manneken Pis as a Santa Claus for two days (24 & 25 Dec). 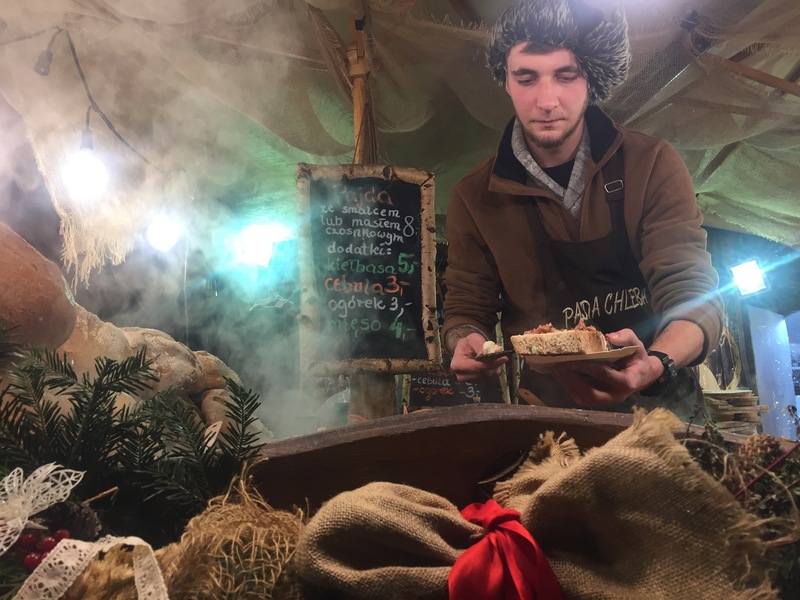 In one market outside the St Vitus Cathedral in Prague, there was this one stall that invited me in with mouth- watering mixtures of potato dumplings (Halušky) with sausage, bacon and sorted cold-weather vegetable. I tried a veggie portion and some hot mulled wine, feeling ecstatic as they melted in my mouth and warmed me right up. 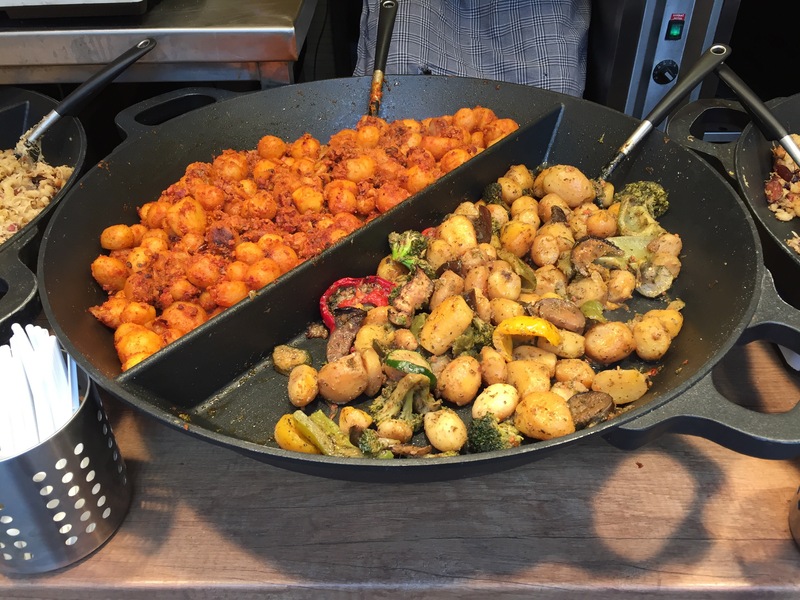 Later a local told me that potato dumpling is not only a Christmas tradition in Czech Republic but also in some other neighboring countries including Germany, Poland and Austria. It was around dinnertime as I arrived in Krakow, so I marched into the Rynek Glowny central square (Old Town) for dinner right after the hostel check-in. On the way to the market there was a free Polish concert so I swung by for a sneak peek. A choir of ten middle-aged singers, accompanied by trumpet and accordion, were performing a joyful folksong that seemed to cheered the packed audience. They were nicely dressed in Polish traditional costumes of mainly red and green colors — women wearing floral full skirt and lace-up boots while men in blue waistcoats and red krakuska cap. Having been to mostly big European cities it was exciting for me to see something very rustic and traditional like that. The cold wind brought irresistible warm smell of food from afar and reminded me that it was time to go. 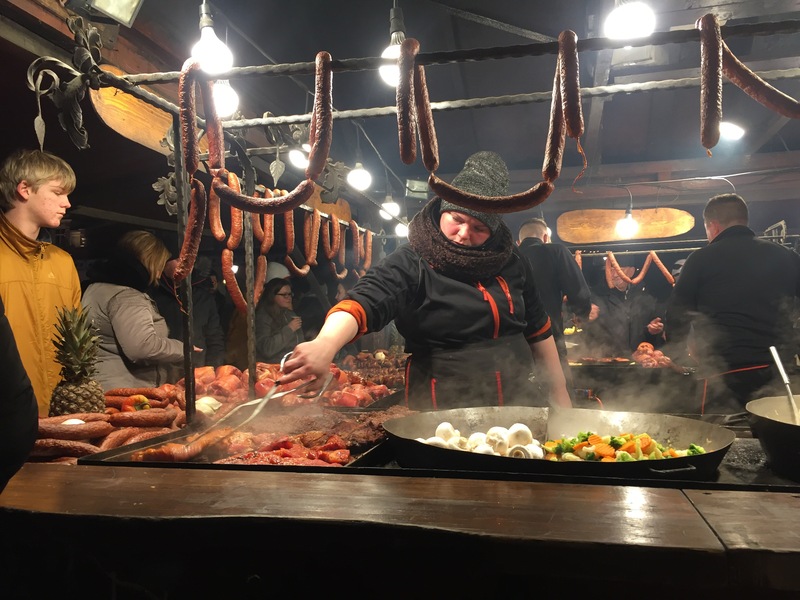 Krakow had one of the best culturally rich Christmas markets by far with a wide range of traditional delicacies. Also it’s was pocket and stomach-friendly. I tried one bowl of creamy pumpkin soup as a starter then a fat but tasty sausage (Kielbasa Krakowska) followed with two or three slices of bread. Only for five euros. What can be more Christmassy than snow? An overwhelming scenery of snow-covered rural villages came into sight when my bus went past the mountains near the Poland and Slovakia border. Almost everything and anything was covered in white, from leafless trees and vast grounds to tiny pointed rooftops. Coming from a tropical country, I had always been excited about snow but never prepared myself for a feeling of loneliness attached to it. There was not a single thing in motion out there. Just a sense of stillness, silence, isolation and somewhat solitude. I went ice-staking on the first morning in Budapest. A friend of mine, who first set footsteps on the ice rink at the age of three, said skating is one of the most popular winter games here especially in the days leading to Christmas. The City Park Ice Rink, the largest in Europe, was extremely packed on Saturday morning. Some were adult beginners just like me, from time to time banging their heads on the ice, while some four-or-five-year-old kids could seriously glide backwards and twirl around like flying. After over an hour of practice I managed to keep balance and finally had some fun on the ice. But ice-staking is just among those Christmassy things everyone does in Europe. Want to know what makes the festive season in Budapest one of a kind? Hop on a Christmas light tram #2 — the one decked in thousands of twinkle white lights that looked as if it were taken straight out of the fairy tale. I mean, who doesn’t want a little trip back in time?